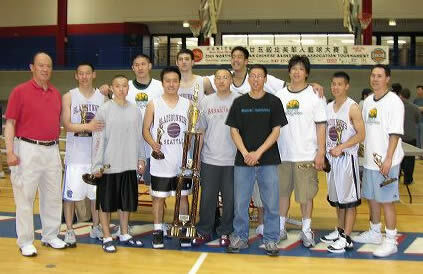 The year, 22 top flight Chinese Mens teams participated in the NACBAIT's Mens Open Elite Division. Following Saturday's pool play, the top 12 teams advanced into the Medal Round, while the remaining 10 dropped into Consolation. Congratulations to NY Maximum Output on taking home the Consolation Championship over the Montreal MMAC Kaitas 48-44. For the 12 top tier squads in the Medal Round, the First Round started off with quite a bang. Jeremy Lee (21 points) and the SF Chinese Christian Union (CCU) jumped out on NY USAB (last year's 3rd place team) and took a 25-21 halftime lead. In the second half, USAB was unable to convert on their opportunities inside the paint and fell 47-42. Up next was a matchup of the 2004 Friendship Champs, the NY Crossbearers and 2004 Mens Elite Open Semifinalist, the Texas Ballistics. Texas showed that their big time experience makes quite a bit of difference as they coasted to an easy 45-35 win. The next game of the round was a shocker of sorts, as the Toronto CCYAA Dragons upset the defending NACBAIT Champions, the Boston Hurricanes AAU 36-33. Although Toronto had never beaten Boston before, they showed true determination as they overcame a 5 point deficit to move on to the Quarters. Denny Lee led Toronto with 11, and Mike Yih dropped 10 for the Canes. The final game of the round was another shocker. Arizona Desert Jade came out ablaze and took an early double digit lead on Washington CYC A. Kwan Huynh (21 pts, 4 treys) got DC back in the game as CYC finally took a 1 point lead with about 2 minutes to go. But #23 Sam Luong proved to be the difference for Arizona as they upset CYC 67-63. In the Quarters, SF Duke showed why they earned the #1 seed as they raced out 25-12 on SF CCU and never looked back during their 60-34 dub. Henry Hong dropped in 19 for SF Duke and All-Tournament Selection Jeremy Lee had 17 for CCU. When the Chicago Dragons faced the Texas Ballistics, everyone was expecting a great game. These two quality teams responded to the pressure cooker, as it was all knotted up 20-20 at the half. Andrew Tsai was bombing from outside as he swished 3 triples to give the hometown crowd something to cheer about. But Texas had other plans and they won 40-38 in the most exciting game of the Quarters. The Seattle Bladerunners then faced the Toronto CCYAA Dragons. This game was never really close, with the gargantuan Seattle frontline shutting down Toronto. Seattle cruised 55-40. The last match of the day was the #2 seeded NY Cruisers looking to move on to the Final Four as they squared off with Arizona. The Cruisers had dominated pool play, and seemed on top of their game. Although All-Tournament Selection George Chan was playing out of his mind (17 pts, 15 boards), Arizona and their gunners were in shooting heaven. They ended up on the top side of the 54-52 game. Monday morning means prime time for 4 teams, and Tournament Party recovery for 18 others. Up bright and early for the first game of the day was Texas v/s SF Duke. Ronald Lim and James Mao provided a solid 1-2 punch for Texas but they could not match the balanced team attack of the Duke. 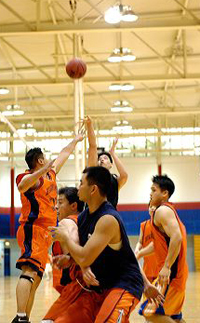 PG Benny Hoang dished it to Ryan Dunn and Henry Hong for the buckets, while forward Dennis Yuen earned himself quite a reputation on the defensive end. He might be the best defender that the NACBAIT has seen in quite some time. SF advanced 47-43 after withstanding a late Texas flurry. The second Semi had tournament Cinderella Arizona looking to stay out past midnight as they trailed Seattle 24-21. 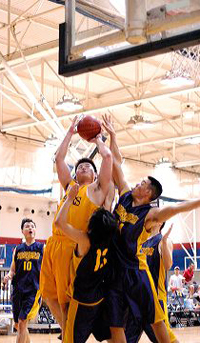 In the second half, Song Cun (18 points, 3 3's, 6-6 FT) showed why he has earned such a great reputation. Song had 16 second half points and iced the game from the line for Seattle. In the Finals, it all boiled down to SF Duke-Seattle Bladerunners. This was a matchup that everybody wanted to see. Big time players in a big time game. A matchup for former LA Alpine guards Benny Hoang and Song Cun. Rosters full of NACBAIT Top 25 players (3 from Seattle, 2 from SF). All the makings of a great game. The only problem for Frisco was that they forgot about unheralded Bladerunner guard Perry Lam. Perry went off for 13 points and turned out to be the difference in the game. MVP Jim Shih did his thing on the down low, dropping in 18. And then Kyle Kiang was Mr. Highlight as he was responsible for a few awe inspiring plays- including a follow up slam dunk and a chase down blocked shot after hustling down the court to prevent any hopes of a Duke momentum swing. Dennis Yuen led SF with 12. Seattle took home their second championship in 3 years, 51-34. Great job to the Bladerunners, and even more congratulations on finding a way to bring home a 5 foot tall trophy.